A Japanese rail company has apologised after a train left a station 25 seconds early, the second such case in months. A continuation of the 3D printed rocket engine injector story a few weeks ago. It has now out performed the milled traditional manufactured injector. The traditionally constructed injectors used in the SLS tests cost about $10,000 each and took six months to build; the 3D-printed versions cost less than $5,000 and only took 40 hours to build. This is a prime example of the 3D printing revolution decreasing costs increasing productivity. 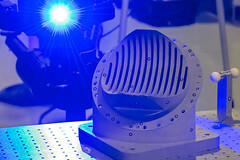 The 3D process used here is selective laser melting (SLM). In SLM parts are manufactured layer-by-layer on the basis of 3D-CAD data out of standard metal powders. First a pwder layer is spread out onto the builing platform of the machine. A laser beam selectively melts the powder and thus a layer of the part is solidified, the platform is lowered and the process starts again until the part is completed. The initial powder is completely melted and the density of the final part reaches 100%. Mechanical properties like tensil strength and hardness match the materal specifications. A wide variety of materials can be processed, ranging from light alloys via steels to super-alloys. Poly-Shape has already optimized and qualified standard industrial materials uch as Titanium alloys, Aluminium, tool steels, stainless steel or Nickel based alloys. Copyright © 2019 Wyly Wade. All Rights Reserved. The Carton Theme by bavotasan.com.